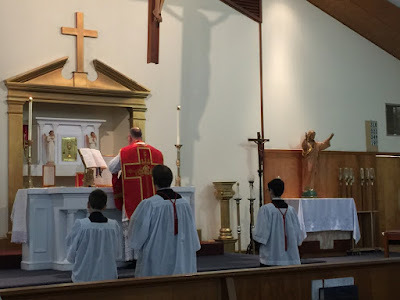 In addition to a daily Mass in the EF, and two such Masses on the weekends, the parish will continue to have daily OF Mass in English, and two Masses in Vietnamese on Sundays. The full schedule is available on the parish website (which is being written by someone with rather a clever sense of humor...) The church is located at 2510 East Hanna Avenue in Tampa; there is also a page with a map on the website. Please be so good to offer a prayer for Fr Palka and for Bishop Lynch that this initiative will flourish. The inaugural EF Mass at Epiphany Catholic Church; from the parish website.